We’ve known for quite some time now that a Lumines port for the iPhone was in the works, and with the flurry of releases lately it likely slipped to the back of everyone’s mind. Tonight LUMINES – Touch Fusion [App Store] appeared for download along with an associated lite version, and so far the reaction in our forums has been all over the place. 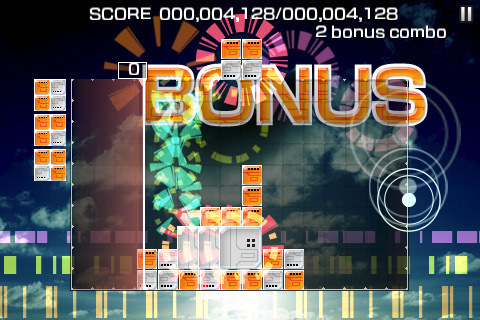 Lumines is a color matching block dropping puzzle game. Squares made of four smaller blocks appear on screen that can be rotated and then moved in to place on the game board. A line moves from left to right across the screen synchronized to the music. When this line passes over groups of four or more matched blocks, those blocks disappear. As the game progresses, the line moves faster and faster. Getting a high score hinges heavily on your ability to set up massive matched groupings of blocks between each pass of the line moving across the screen to clear them. Lumines is played with different unlockable “skins" that change the appearance of the board and the soundtrack. The problem with the iPhone port of Lumines, predictably, are the controls. Lumines is a fast paced game that obviously relies heavily on quick rotation and accurate positioning of the blocks to survive for very long. The control scheme of the iPhone port involves swiping to move blocks and tapping to rotate them. This sounds good on paper, but in practice the game can rarely determine what your intentions are unless you play much slower with much more deliberate on-screen gestures than you normally would. If you’ve never played a Lumines game before, give the lite a try just because the mechanics of the game are worth experiencing. But even if you’re a fan of the game series, I’d still recommend sticking with the lite first to test out the controls.